This article contains facts and information about the life and times of the famous Native American Indian chief known as Little Turtle. Who was Little Turtle and why was this Native Indian chief famous? Summary: Little Turtle aka Michikinikwa (c1747 - 1812) was a famous war chief of the Miami Native Indian tribe of the Great Lakes region. Chief Little Turtle successfully led in raids on settlers in the Northwest Territory and is famous for his victory known as La Balme's Defeat and the 1791 Battle of the Wabash. Subsequent defeats forced him to sign the Treaty of Greenville (Ohio) in 1795. The following fact sheet contains interesting facts, background history and information about the life of Little Turtle and the events in history that led to his fame as a great Native American Indian leader. The following Little Turtle timeline charts the resistance of this great Miami war chief against the encroachment of lands in Ohio. 1774: Lord Dumore's War. The British defeated the Miami in the Battle of Point Pleasant, but Little Turtle emerged as a strong Miami leader. 1780: La Balme's Defeat. Chief Little Turtle defeated the French led by Augustin de La Balme during this revolutionary battle. 1785: The Western Confederacy was formed consisting of many different American Indian tribes including the Shawnee, Iroquois, Potawatomi, Ottawa, Shawnee, Delaware, Chippewa (Ojibwe), Kickapoo, Wyandot and the Seneca tribes. The objective of the Western Confederacy was to keep the Ohio River as a boundary between Native Indian lands and the United States. 1785: Little Turtle's war aka the Northwest Indian War (1785–1795) erupted. 1790: Conflict with General Josiah Harmar who attempted to subdue Native Indians in the Northwest Territory. General Harmar was defeated by a tribal coalition led by Little Turtle and Blue Jacket in an engagement known as "Harmar's defeat"
1791: Battle of the Wabash on November 4, 1791. Chief Little Turtle led 1,000 warriors into battle against Major General Arthur St. Clair's 1,400 federal troops. American Indians were led by Chief Little Turtle and Chief Blue Jacket won a major Native Indian victory against Americans led by General Arthur St. Clair. It was the U.S. Army's worst defeat up to that time in its long-standing conflict with the Native Indians. 1794: Battle of Fallen Timbers on August 20, 1794. The Legion of the United States, which was an extension of the United States Army, led by Major General Anthony Wayne defeated Little Turtle and the Native Indians. 1811: The Shawnee chief Tecumseh continued the fight against the US during Tecumseh's War (1811–1813) in a final attempt to reclaim Indian lands. 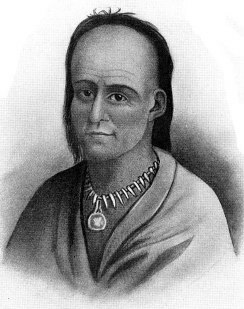 Little Turtle continuously advised cooperation with the U.S., refusing an alliance with the Chief Tecumseh. 1812: The War of 1812 (1812 - 1815) broke out. 1812: The siege of Fort Wayne prompted William Henry Harrison to order punitive expeditions against the Miami which culminated in the Battle of the Mississinewa December 17–18, 1812. A large number of Miami Indians were killed and Miami villages were burnt to the ground. 1826: The Treaty of Mississinewa forced the Miami tribe to cede most of their land to the US government. For additional facts and interesting information refer to the Story of Little Turtle and the Wars with the Western Indians. Discover the vast selection of pictures on the subject of the tribes of Famous Native Americans such as Little Turtle. The pictures show the clothing, war paint, weapons and decorations of various Native Indian tribes, such as the Miami tribe of Little Turtle, that can be used as a really useful educational resource for kids and children of all ages studying famous Native Americans such as Little Turtle. We hope you enjoy watching the video - just click and play - a great educational resource for kids.